Duritos Wheels Wheat Snacks by El Sol de Mexico 16 oz. Duritos Wheels Wheat Snacks for frying. Flour pellets to make flour chicharrones. A pasta pellet product called "duritos", made from wheat flour. Before cooking, they are hard, orange in color, and look like little pinwheels. Duros. Durros. 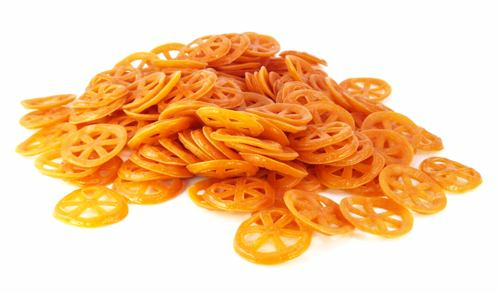 Duritos Wheels are a pasta pellet product and a delicious favorite wheat snack. They are hard, orange colored, and they fluff up and have a light, airy consistency similar to chicharrones after they are fried in oil. Even though Duros and chicharrones both contain comparable amounts of fat, chicharrones have more protein while Duritos are mainly carbohydrates. Duritos are sold in small bags in the local tiendita doused in Valentina hot sauce or chamoy sauce, they are inexpensive and a great alternative to big brand chips and cacahuates. Duritos Wheels also known as Duros or Durros probably caught your eye while browsing MexGrocer.com, at the Hispanic section of your local supermarket, and maybe remember when you had them at a Feria (fair) or at school during lunch when you were growing up and always wanted togive it a shot or have them again. Pick up a bag and try them, they are not only a fun cultural activity and treat, but are easy to make and delicious as well. 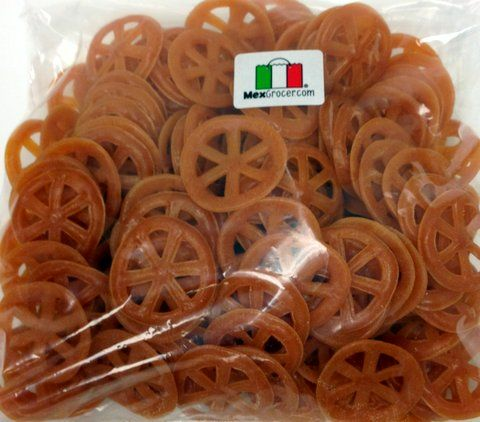 Although Duritos, are commonly made in 1-inch square pieces and round wagon wheels shapes, they also come in many various sizes of strips and squares. Duritos de chicharron de harina en forma de rueda. Duritos ruedas. Botana de harina de trigo para freir. Los Duritos de Chicharron en forma de ruedas, son un producto de pasta, y deliciosa botana de trigo. Son Duros (de ahi su nombre), de color anaranjado y se inflan con una consistencia ligera, aereada con consistencia similar a los chicharrones, despues de ser fritos en aceite. Aunque los Duros y los Chicharrones tienen una comparable candidad de grasa, los chicharrones tienen mas proteina, mientras que los duritos son principalmente carbohidratos. Los Duritos de Chicharron eran banados en rica salsa picante como Valentina o chamoy son de bajo costo, deliciosos y una gran alternativa a las papitas o cacahuates demarca. Seguro recuerdas cuando los comias en la escuela a la hora del recreo, en las ferias o haberlos visto mientras navegabas MexGrocer.com o en la seccion hispana en tu supermercado favorito y tenias ganas de comerlos. Compra una bolsita y pruebalos, revive tu ninez otra vez. Los Duritos de Chicharron son una botana divertida y facil de hacer! Aunque los Duritos de Chicharron se hacen en piezas cuadradas de una pulgada y en forma de rueda, tambien los hay de diferentes formas y tamanos de tiras y cuadros. Harina de Trigo, Almidon de Maiz, Sal y Bicarbonato de Sodio (para ayudar a la expansion incluso durante la coccion). Hello, does anybody know how I can get these in Brisbane, Australia? Absolutely in love with them!! Please help �Ÿ™ willing to buy bulk!! Great snack at anytime, so easy to make, and can spice them up so many different ways...from red pepper to cinnamon sugar! Great product - great price - thank you MexGrocer.com! Loved this product and you price and quick ship - will be back for more goodness! Thanks! Can someone please help me Im looking to buy a 50lb or by wholesale for Duriots Wheel Wheat Snack?? THANK YOU. I had never had these before and liked them a lot! They surprisingly puffed up and were really crispy! Everyone who tried them liked them a lot. Consthe were all eaten up too fast! I use them in my Spanish classes to give the kids a treat. They beg for them all year and love them with powdered sugar or cinnamon sugar. I call them "Magic". They take home to show their families and kids come into Sp. 1 asking for them because they've heard their siblings talk about them. ProsFast and easy. Can make in no time once the oil is hot. I can fill up 25 teenagers in one class period. ConsHave to have enough oil or they don't puff up right. I would get these from a local vendor that walked around town. Fried them up and add some lime juice and hot sauce..hmm. Very nostalgic of my hometown. delicious and fun to make as well! I put about 8 of them on a paper plate in the microwave (instead of deep frying) for 20 seconds. Then I spray very lightly with spray butter and then sprinkle tajin clasico lime seasoning on them. (cooking in microwave instead of deep frying is healthier) Great snack. very good, but would like calories, ingredients, etc.